Ambient air enters the inlet filter, is compressed, and increases in temperature in the compressor section. The air (T1) is then piped to the regenerator/recuperator (PAL-TEX), which heats the air. The heated air (T2) is then returned to the combustor and the turbine section of the engine via piping. After the exhaust gas is expanded through the turbine, the exhaust gas (T3) is ducted through the regenerator where the waste heat is transferred to the compressed air. In effect, a portion of the exhaust heat that would otherwise be lost is transferred to the compressed air; thereby, decreasing the amount of fuel that must be consumed to operate the turbine. This process reduces the amount of fuel required to reach combustor temperatures. Depending on the pressure ratio a dramatic increase in cycle efficiency can be achieved by the use of a regenerator. This process is called the regenerative cycle and is designed to increase the efficiency of gas turbines. If a turbine is not utilizing the heat from the exhaust gases it is called simple cycle or open cycle. The Gas Turbine regenerative cycle is not a new concept. Many companies originally came to market with a gas turbine product that utilized a regenerator/recuperator. In fact, Pal-Con, Ltd. has recently replaced an older tube-type regenerator on a MS3002 recuperated gas turbine that was commissioned in 1948 with a Pal-Tex. This turbine is one of the oldest turbines still in use. This video breaks down the gas turbine regenerative cycle. It describes the flows and explains what is happening at each part of the process when a gas turbine is coupled with a regenerator/recuperator. This video shows a example of the difference in combustion systems of a simple cycle gas turbine and a regenerative cycle gas turbine. 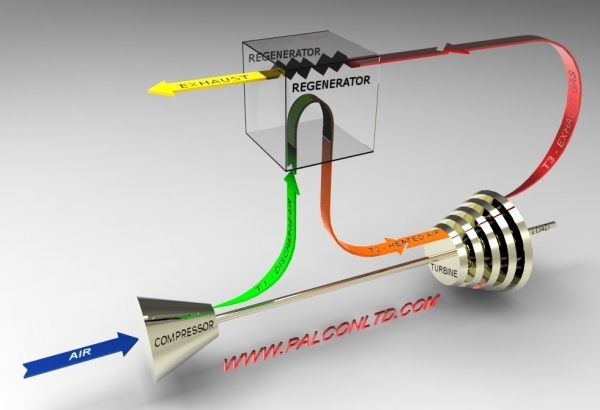 There are many different types of combustion systems used for regenerative cycle. This is just an example of what one might look like. Note that this is not a exact representation but just an example to illustrate some of the substantial differences between the two cycles.